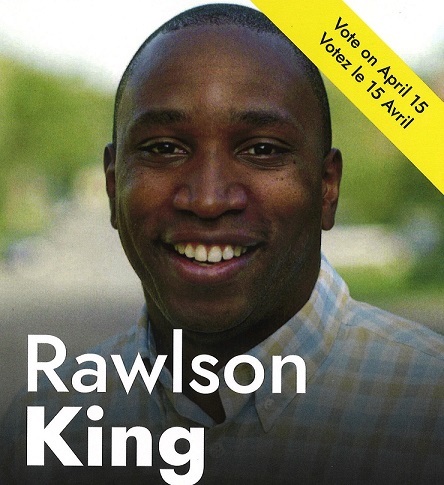 Rawlson King is running in the Ward 13, Rideau-Rockcliffe by-election because I believe Ward 13 needs experienced leadership to address issues of planning and development, public safety and improved transit and transportation at City Hall. We have serious issues concerning gangs, guns, shootings, lack of economic opportunities, lack of social investment, lack of affordable housing and transit, along with nuisance developers. All these problems require serious solutions which I believe I can effectively address because of deep community involvement over the years. I’m an experienced, result-based community leader who has lived in Rideau-Rockcliffe for 15 years and have been a very involved volunteer for about 10 years on a wide range of civic issues across the Ward. I am currently the President of the Overbrook Community Association, where over the last three years I successfully advocated for a youth strategy for Ward 13; led the organization when it raised $42,000 to hold a highly-acclaimed musical; helped obtain heritage designation of a former neighbourhood public school; assisted in piloting a post-incident response plan to serious crime, now used City-wide; supported the creation and opening of a new community park in the Ward; and was a vocal leader in the fight to keep Rideau High School open. I am also a Board member and Treasurer at the Rideau-Rockcliffe Community Resource Centre, a $1.8 million facility that provides social services to Ward 13 residents, which has successfully advocated to establish a new community hub in the former Rideau High. I was also recently appointed Co-Chair of the new Ottawa Police Service Community Equity Council where I help build relationships with police, Indigenous, faith-based & racialized communities. With Ottawa projected to reach one million residents by Canada Day, the two major issues confronting both the city and Ward 13 include public safety and affordable transit. As the population increases in our City we will be confronted with more gun violence. Having dealt with several shootings in Overbrook over the last three years and noting increased violent crime across the ward, my campaign has called for a city-wide handgun ban. I also believe that the City needs to be proactive in implementing a violence reduction initiative, which would see a surge of social investments in high-need neighbourhoods, ranging from improved street lighting to employment services. Our campaign also wants to address transit by implementing a fare freeze. Ottawa has the highest fares in North America, which has contributed to falling ridership. We believe that if fares become more affordable, ridership will improve, along with revenue and overall service.